I love this designer’s take on modern kitchen design. Pairing the shiny ebony cabinets with beautiful marble slabs and muted grey plank flooring, creates a bold and unexpected look. Too often kitchen design ideas feature the same cabinets or your typical granite countertops, but this offers inspiration to homeowners that want to bring something unique to their home decor. Don’t be afraid to bring elements of this modern kitchen into your design. For example, I think this color palette would work alongside a variety of decor and architectural styles. You can even play around with cabinet styles or fixtures to tone down some of the contemporary look if it is too much for your space. 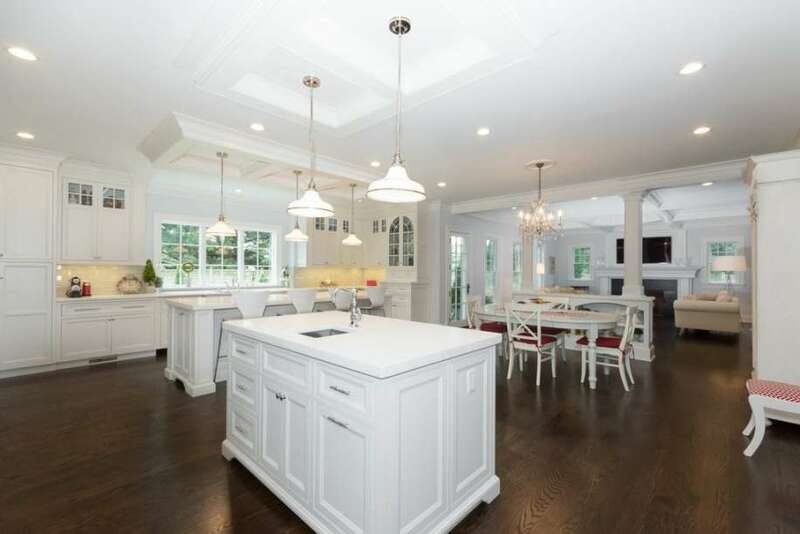 This house is such a fun twist on typical white kitchen designs. 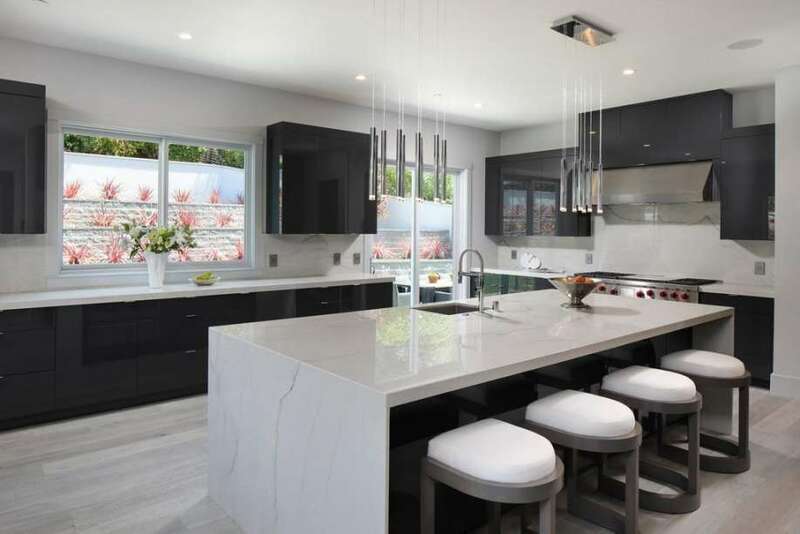 I love how the designer paired classic white paneled kitchen cabinets alongside bold black accents. It creates an unexpected and very contemporary version of traditional decor. Even better, I think this look would be really easy to recreate without the designer price tag. Simply adding bronze hardware on existing white kitchen cabinets and installing black granite or solid surface countertops would mimic the style. You could finish the look with some unique modern light fixtures featuring the same bronze metal accents. Selecting the right kitchen cabinet design can determine the entire look of your room. There are endless style possibilities available, whether you prefer dark contemporary cabinets with sleek lines, or are more attracted to a beautiful rustic French design like this home. No matter what decorative profile you choose, it is important to consider your kitchen design as a whole prior to selecting your units. For example, if you want to include a beautiful kitchen island like this one, be sure to lay out your floorplan accordingly. This designer did a great job of maximizing the functionality of the space while encouraging a natural traffic flow in and out of the kitchen. I have been on the hunt for kitchen remodel ideas to update our new home. As you can see, there are both positives and negatives to our current space. We have an updated range, hood, and oven as well as a good layout and traffic flow. I think that the outdated travertine flooring needs to go, and the cabinets could use a facelift. 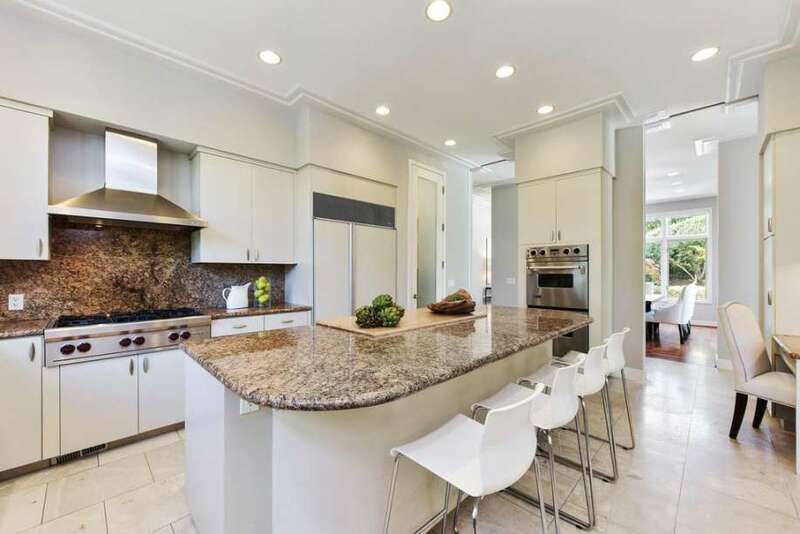 I think that our architect incorporated some really smart small kitchen design elements that help to maximize the functionality of the space as well as generate great traffic flow between our kitchen and living room. It functions as one large unified space rather than two isolated areas. 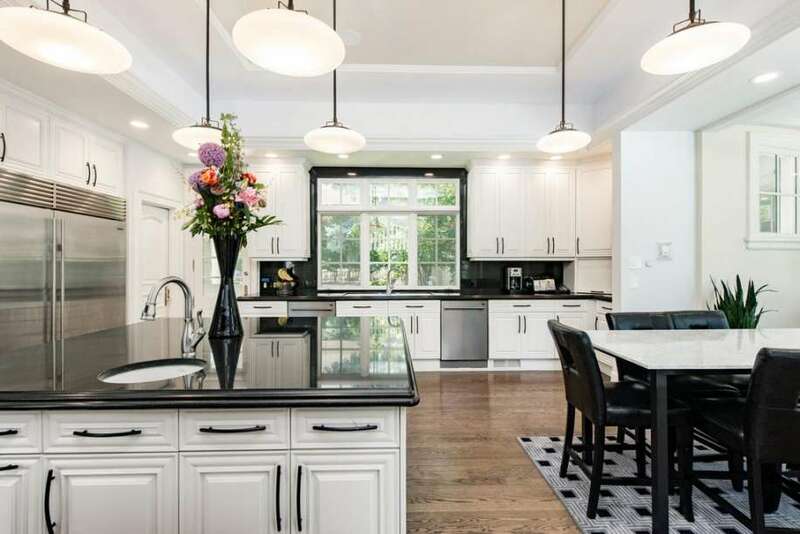 When you think modern kitchen design, visions of sleek black and white color schemes, bold stainless steel accents, and dark espresso woods come to mind. I rarely see modern kitchen cabinets done in a beautiful light pine color, and I actually love the look. Paring this unique shade of wood against the slate floor and large picture window creates a very organic decor scheme. This in addition to the marble dining table and pops of chrome metal accents on the chairs and barstools bring a very retro vibe to the space. 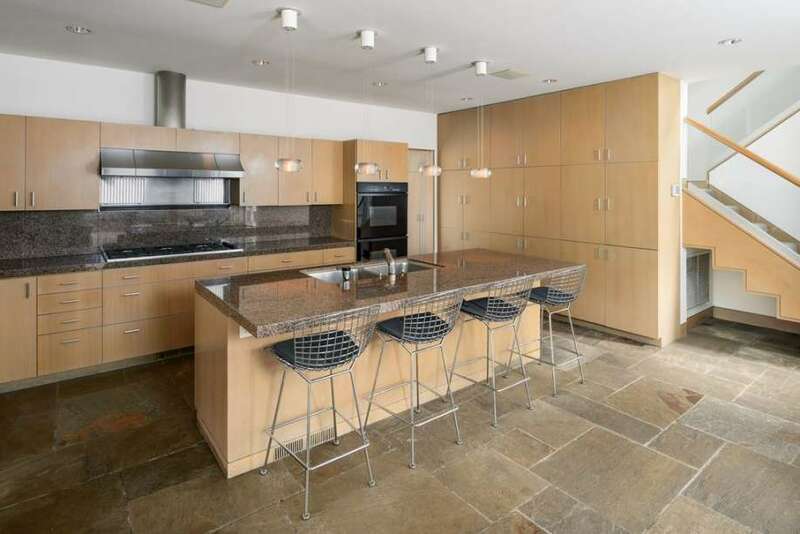 Unfortunately, I don't think this modern kitchen design style would blend well with my traditional decor so I will have to live vicariously through the homeowner. In my opinion, beautiful and functional kitchen island designs really add that wow factor to a room. I love how this homeowner took their remodel to the next level by adding not one, but two islands to the floorplan. This is such a creative twist on your average kitchen makeovers because it doubles the storage space and usable countertop area, while adding even more seating options. Plus, the all-white cabinetry and solid surface countertop make the units look sleek and streamlined, preventing them from overwhelming the space. 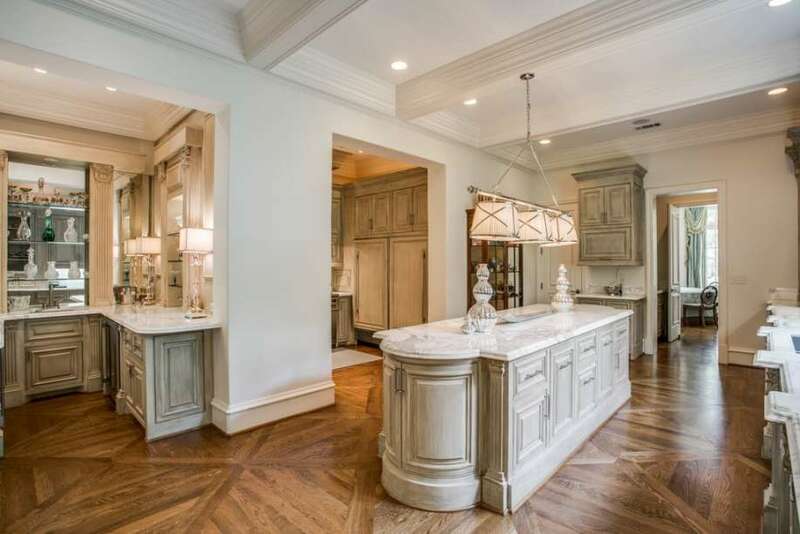 My only concern with adding multiple islands to your kitchen design is traffic flow.